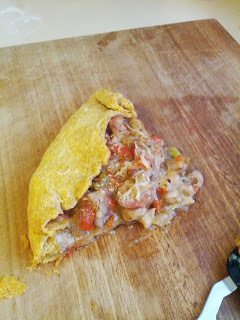 I made this pie for lunch because I was having friends Sam and Jesse over who I know like Spanish cuisine. They are particularly fond of chorizo sausage. This recipe is from Woolworths Fresh magazine, issue 90, August 2013. Yes, the free one from the store. 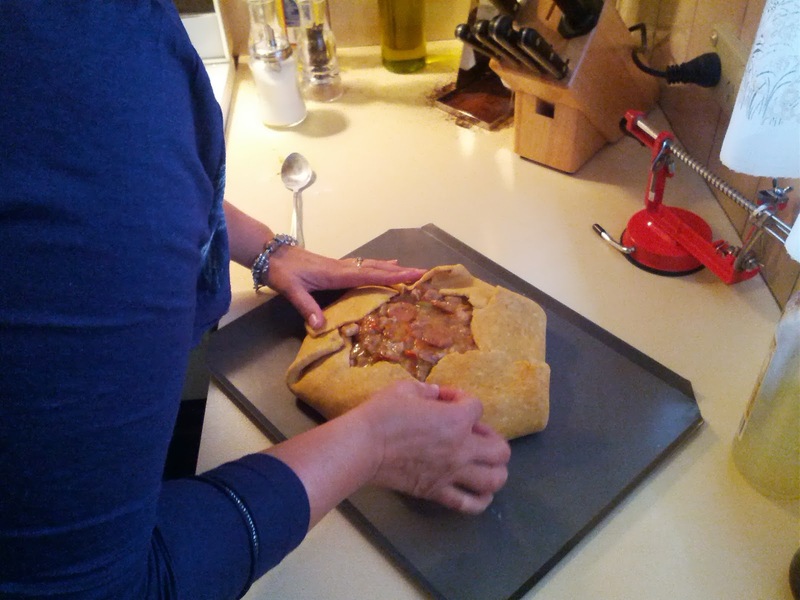 laying the ingredients onto the pastry and folding the sides up and over (but not completely over) to hold the filling in. First the pastry is made by placing the 2 cups of flour, paprika, salt and chopped butter into a food processor. Process until the butter is small like breadcrumbs. Add the egg and process until the mixture forms a ball. Well, that's the theory. I processed the mixture for some time before giving in and adding a bunch of water to make it ball up. I used a large egg too... Remove the dough, squish together and wrap in plastic. Chill for at least 30 minutes. You can make it the day before and store in the fridge, or up to three months before and freeze (defrost in the fridge). Heat the oil in a pan and cook the chicken, in batches if necessary, until browned. Set aside, ensuring there's oil in the pan. Add the chorizo, onion and capsicum and fry for 5 minutes. Stir in the 1 tbs flour, pour in the stock and add oregano and chicken. Bring to boil and reduce to simmer for 15 minutes or until it's not too runny. Stir in olives and take off heat. Roll pastry out (using additional flour on the rolling surface and top of the dough to keep it from sticking) until about 35cm in diameter. Transfer to cooking tray. Spoon filling into centre, leaving about 4cm around the edge. Fold in sides, sprinkle with cheese. You can also brush the pastry top with another beaten egg, but I didn't do this (it just makes the pastry brown more). Bake for 25 minutes (well, in my oven 35 minutes). Serve!